5 out of 5 rating See my short demo video of this below. This is made with a Spicy clove and ginger scent. Those of you familiar with Hot Toddy and liked it, would like this. This wand-type, re-usable bubble bar is an absolutely beautiful orange-red color, with golden shimmer. It leaves the water a red color with golden shimmer in it. The red doesn’t stain the tub in any way. It’s a strong spicy scent. Especially good if you need warming up on a cold night. Lush description: Awaken the Dragon – A roaring hot, ginger and cinnamon bubble bath to put a little fire in your belly. 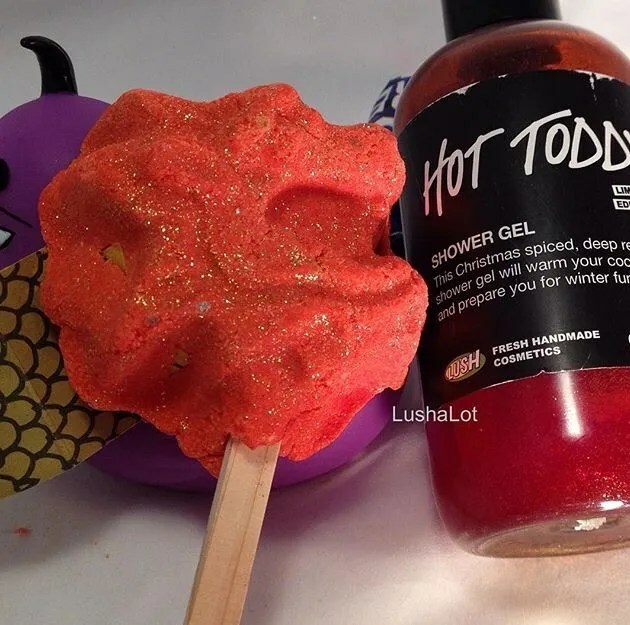 Posted on April 24, 2015 by Lushalot	• This entry was posted in Bubble bars, Lush Oxford Street store exclusives, New and tagged 2015, cinnamon leaf oil, clove bud oil, ginger, gold, gold gliiter, gold sparkle, little dragon, lush oxford street exclusives, oxford street, red, reusable, reusable bubble bar wand, shimmer, video. Bookmark the permalink.